If you ask a Bangalorean which are the places you can visit in and around his/her dear city, it is highly likely that Nandi Hills may be one out of the two or three places s/he may suggest. To know more about the place, you can check out what Wiki has to say. I don’t want to ramble on about how much fun it was to take an early morning trip with my friends. I am not going to tell you how breathtakingly beautiful the place was, how amazing the climate was or the fact that I did not want to leave the place ever. But I will share with you some photographs we clicked. Some others I have borrowed from the net as we were too caught up in the moment to even think about freezing time on camera. The start of this year has been unusually good for me! Mostly because I did something I have never done before for New Year’s – I took a trip with my family! And not just to any place but to Wayanad! Its almost as if I got bitten by the travel bug! 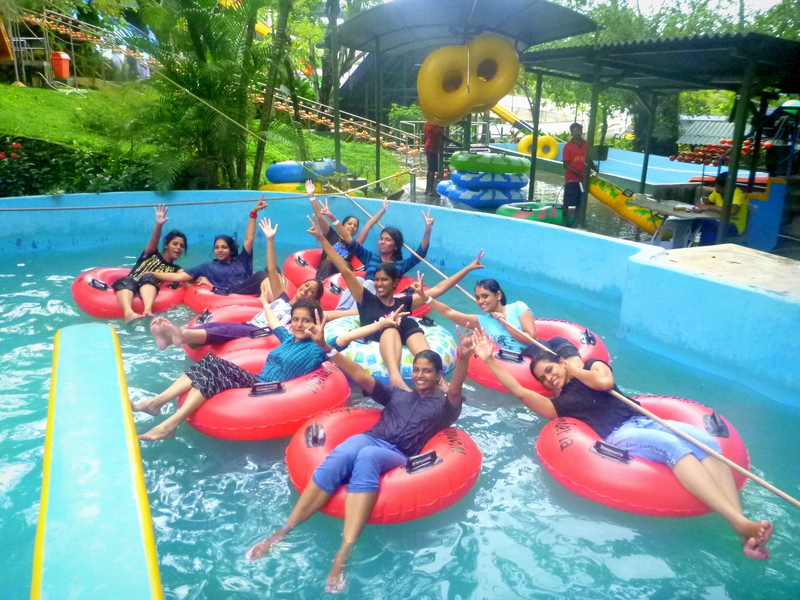 I have been going places of late.. Before I could get out of the Ezhattumugham hangover and the reactions from people, we went on our excursion to Wagamon and Wonderla. The drive to Wagamon took about 5 hours . But time flew like anything as music blared and we danced like anything. Crammed together in the aisle of the bus!! On reaching we found that Spice Garden Farm was a medium-sized hotel with a scenic view of the valleys in Wagamon. In the restaurant, we were served a decent breakfast consisting of Puttu and Dosa with vegetarian as well as non-vegetarian curries. After everyone was done eating and shooting, we proceeded to the pine forest. It was a beautiful location which had paths leading down the hill with trees lining the way on either side. More photographs, a little bit of trekking, a few leech attacks and we were good to go! As we headed out of the pine forest. there was a slight drizzle which we happily welcomed. Lunch was arranged at Kurishumala which is a scenic pilgrim spot maintained by the Cisterian Monastery. We had our lunch sitting atop rocks and finished it off with icecreams. 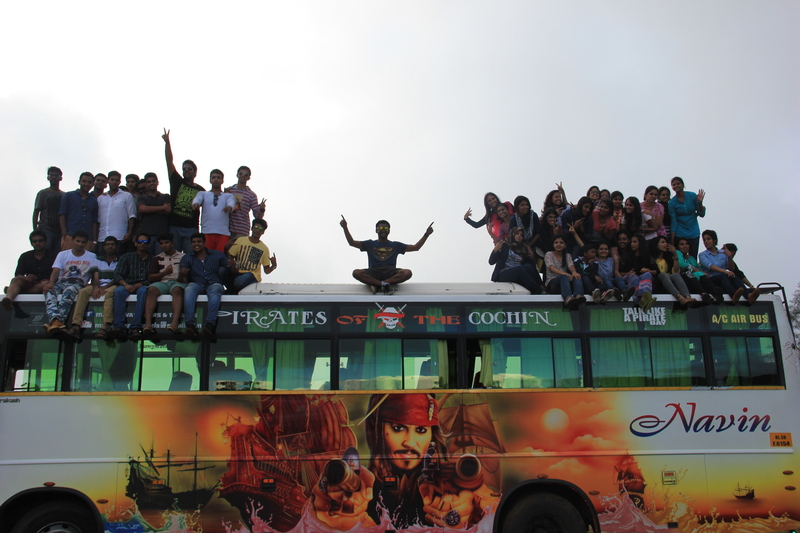 As a post lunch exercise, we all clambered up the bus to click pictures. We were too exhausted to climb up the hills and so we returned to the hotel. But most importantly, the river!! We went back to our rooms to freshen up and change. We gathered at an open area for the campfire. The hotel authorities had arranged some artists to sing for us. The performance was very ordinary but we had our share of fun as we pranced around the fire with some crazy moves. Post-dinner we all went back to our rooms where the rest of the commotion and chaos took place. Next day morning, after considerable delay in schedule and a sumptuous breakfast, we started for Wonderla at 9 am. There was more music, more dance and more noise. Before we knew it, the day was over. We all went to the wave pool and drowned ourselves (like literally). We created a ruckus as we drowned. Cheering and howling, wading towards the far end of the pool as the guard kept blowing his whistle! Finally, it was over. We showered and changed before we ate some snacks and headed back to the bus. We went to a hotel at Edapally for dinner. I couldn’t stay as my parents picked me up to go home. As I climbed into the bus I realized how tired I was. Life keeps getting in the way and its almost impossible to sit down and write whats going on. Because there’s so much to say and so little time..!! The most recent update being the trip I took with my family day before yesterday. I don’t remember the last time I went on a care-free trip with my cousins. The only memories I have of such trips are safely compiled in select photo albums. Like my cousins I am a school-going kid in all the pictures. Yes, we do meet every now and then. When someone gets married, an uncle or aunt turns sixty, when a couple celebrate their anniversary, Onam, Vishu, Christmas and whenever there are such cliche yet special occasions. But there’s never been a time in the last five years, when we all just wanted to take a break from whatever we were doing and get out of home. Not until day before. We decided to go to Ezhattumugham, a riverside picnic spot situated about 12 kilometres away from Nedumbassery airport. Even though I was a little skeptic initially about going to the place, what I saw as we reached there made me change my mind. Set in a secluded area with pristine green vegetation, the location by itself was beautiful. The river was enchanting as it flowed through thick forests forming rock pools of crystal clear water which served as bathing banks for all. Plus, the Ezhattumugham-Thumpoormuzhi hanging bridge only added to the beauty of the place. By the time we got out of the water, the sun was high up on the west. After a quick snack and some ice creams, we headed out to the Prakrithi Gramam Park on the other side of the hanging bridge. The park was pretty big for its kind on a river bank. It had a beautiful garden with all kinds of flowers and plants. My cousins and I became children again as we went inside the park. The swings, the see-saws and the slides brought back some truly happy memories we had shared a decade ago. All the more surprisingly, our parents became excited and took turns at the bigger swings. 😀 Here was a park where there were no boards for age limits, where you could use the swings and slides without having to struggle to fit in or fearing you would break it. I wouldn’t ever forget the smiles that flashed across any of our faces or the laughter which filled our ears that day.